You may not think that it’s important to wash your car every week, but for your tires, this step is crucial. 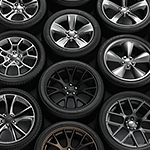 You can develop a tire bloom if you don’t wash your tires often of dirt and debris. This should be done at least once a week, and you don’t have to spend too long cleaning your vehicle for it to maintain a good shine. With your wheels, you want to use a garden hose, small bucket, tire cleaner, and tire gel. You can also get a microfiber towel and a tire brush if you want to ensure you get the most thorough clean. It’s important that you also start with cleaning your tires, as you’ll end up splashing more grime from your tires onto the body of your vehicle, especially if you use a garden hose.